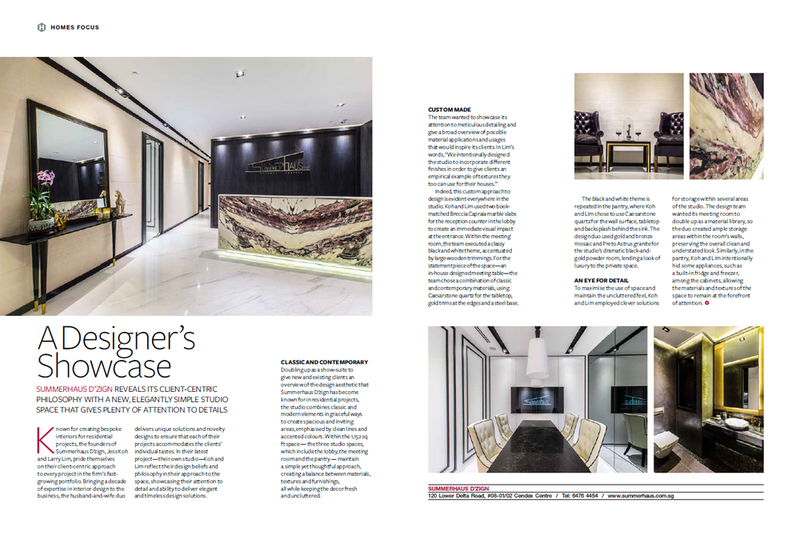 Known for creating bespoke interiors for residential projects, the founders of Summerhaus D’zign, Jess Koh and Larry Lim, pride themselves on their client-centric approach to every project in the firm’s fastgrowing portfolio. Bringing a decade of expertise in interior design to the business, the husband-and-wife duo delivers unique solutions and novelty designs to ensure that each of their projects accommodates the clients’ individual tastes. In their latest project—their own studio—Koh and Lim reflect their design beliefs and philosophy in their approach to the space, showcasing their attention to detail and ability to deliver elegant and timeless design solutions. creating a balance between materials, textures and furnishings, all while keeping the decor fresh and uncluttered. Indeed, this custom approach to design is evident everywhere in the studio. Koh and Lim used two bookmatched Breccia Capraia marble slabs for the reception counter in the lobby to create an immediate visual impact at the entrance. Within the meeting room, the team executed a classy black and white theme, accentuated by large wooden trimmings. For the statement piece of the space—an in-house designed meeting table—the team chose a combination of classic and contemporary materials, using Caesarstone quartz for the tabletop, gold trims at the edges and a steel base. the studio’s dramatic black-and gold powder room, lending a look of luxury to the private space. the materials and textures of the space to remain at the forefront of attention.